We all know that sound is traveling wave, which is an oscillation of pressure transmitted through a solid, liquid or gas, composed of frequencies which are audible. We don't speak of them like we see of them. Coz we don't, right? Apparently not. 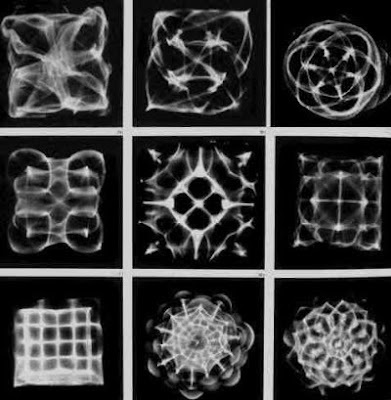 Cymatics is a study of visible sound through vibration, typically on a surface on water, plate or a membrane. One of the earliest to notice that an oscillating body displayed regular patterns was Galileo Galilei, whom discovered visible sounds when he was scraping a brass plate with a sharp iron chisel in order to remove some spots from it. Not going too far into the history of cymatics, our urbanite Evan Grant has managed to introduced the idea, more of the existence of visualizing sound in this 5 mins TED presentation. 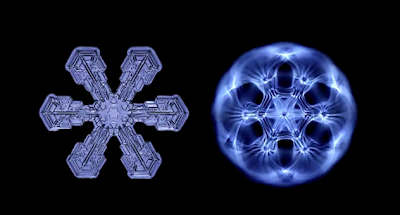 From snowflakes to amoeba, everything takes a form, shape, or even as data. These aren't new discoveries, just that we spend less time being aware of minute little things that could be discreetly important. Visualizing sound with cymatics, is a primitive art form, yet a beautiful fundamental. You can even DIY cymatics if you are keen to see how Daft Punk's Aerodynamics soundwave would look as opposed to Massive Attack's Teardrop. Maybe sometimes, we ought to spend some time putting a microscopic mind to the things we often not think much about. Imagine working with them now knowing that you can see them. .neurosonics audiomedical + beardy man. Remember UK's beardyman guy who does incredible beatboxing to drum 'n' bass at Google's office 2 years back? Neurosonics Audiomedical Labs fellas has just given him and their techni-gear a face/lift. Holographic one too btw. Playing live WYSWYG - no post video production. Yes yes. I hear you. Have been away much since i left the hamster wheel. Life as a street rat has been good. Going around to places after being desk-bounded for some time. So much fun that i've even gotten lazy to rave about it. Not even a single facebook album just yet. Not like I don't enjoy flaunting like everyone else does, and I should still enjoy sharing any experience i stumble upon, and be eager to shout to the world that i've conquered something and pretend that anyone or someone would care. Things like i've tasted a mutated siamese tomato and that i managed to hiked to up the tiniest hill in Jeju islands (korea) where i can bust the myth of my granny knock knees. Iceland, Sweden, Denmark, London, Thailand, Korea. Where i've put my feet on past 3 months since the day i threw my letter. It's kinda liberating. And still not getting enough out of this resting phase yet. I don't know. My mind wanders in proliferation that i myself find it hard but perhaps should anchor it down for a bit. As much as so many things keeping me happy, wanting more of it means i'm less happy the time before each time. And each new experience has safely bewildered me while it washes down the past experience somewhat. Like i am forever seeking something bigger, better, and more magnificent the next. And if it doesn't, i get frustrated or disappointed, if not worse, numbed to feel the gratification of owning that moment, while others would trade for the place i'm in. Whatever happens to contentment? Am i losing sight, control and grip of it? Oh well, that's just the safety-mechanism of my conscious talking. Screw that. I want more. 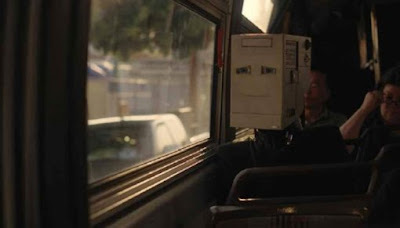 I wonder - The more connected i feel with the world, the more disconnected i feel at the same time. Like, i feel less. Just nothing but a small piece of lego in the work of a whatever built and stacked robot, house, or warship. I just move around as the plans come along. As I always say : Attach, detach, never belong. Here's a trailer of queer-master Spike Jonze's new half hour short film. I'm here. A collaboration with Absolute Vodka to explore humanity with a robot (yea i know. But let's give Jonze the allowance to surprise). I'm waiting for the release to see how much i can relate to it. Hah. Btw, nicely tucked website they have. Do take a a minute for that.